New SB for my 1k (done for the Lightweights challenge) by a whole 0.1s !! Gets me a whole Nonathlon point too. By default it's a 3 year SB as my previous SB was one already. Died totally in the last 50m and finished with arms only for the last 3~4 strokes so maybe there's another 0.5~1.0s in there if I can actually still have functioning legs through to the end. Well done Dave. That's a lot of pain for 1 Nonathlon point! Afternoon, not sure I've ever posted here, but I'm rather chuffed with this one. After several months of attempting to regain some fitness, and multiple attempts at this, today's score is 15012m for 1 hour. Sadly that means I'll need to try 1:55 for 30 min, but I'll enjoy this for a while first. Well done fellas - great news. I'd love to be able to squeak over 15k again for 60 mins but I'm not even worrying 14.8k at the moment. Well done Steve and Jonny for going sub 2:00 pace over the hour of power! I doubt I could manage that at the moment? Happy with an improvement by 8.2 seconds (and three nonathlon points), but looking at the splits now I should have started maybe a second quicker, so might have another go soon (would be really great to go sub 39 again...). Nice 10k Peter - looks nicely controlled with some in reserve. After my 100m and 1 min PBs this week I had a go at my 500m to try for an SB. It was 1:38.5...... but is now 1:37.0! - and not only a 1 year SB but my third fastest of all time. Actually got some Nonathlon points too - 14 of them. The last 150m were truly horrible! Well done Dave, you are starting the calendar year in great form! I agree, very impressive Dave. Thanks guys - my lungs are still rattling 4 hours after that! An SB for the IRL 2K today of 8:37.0 which improved on my previous best by 5.3 secs. Fantastic SB Captain! Leading by example as always . Finally fully recovered from my cracked rib in November and have been feeling pretty strong recently. 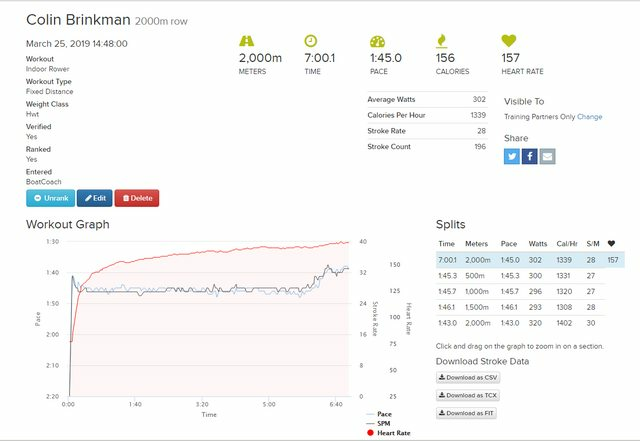 Set SBs in 500, 2000, 6000, 10000, 30', and Half Marathon since 2/17. 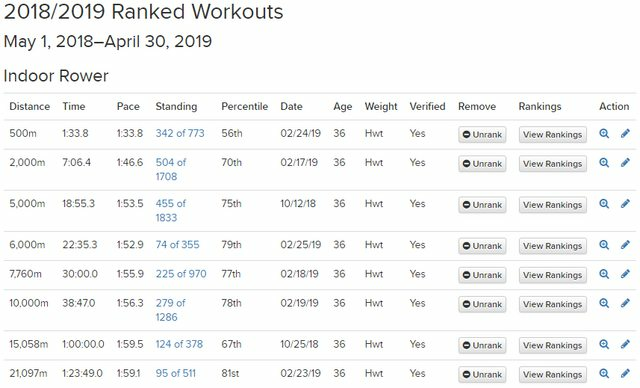 Hoping to knock off a few of my 13 year old PBs this year (and maybe drop those last 3 lbs back to lightweight status).